Ministry Eldresses were often engaged in tailoring. The spiritual life of each Shaker community was overseen by two Elders and two Eldresses who together constituted the Ministry. The Ministry of the Hancock Bishopric had spiritual oversight not only of the Hancock community, but also of Tyringham, Massachusetts, and Enfield, Connecticut. 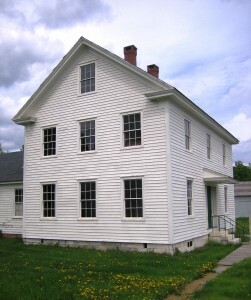 The Ministry regularly traveled among the communities in their bishopric, using the upper stories of the Meetinghouse for their lodgings. 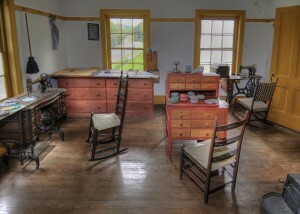 The Ministry Shop served as a workspace for the Elders and Eldresses, who were under the same obligation to perform hand-labor as the brethren and sisters under their care. The Hancock Ministry was formally abolished on June 18th, 1893. The Ministry of Mount Lebanon, New York took the Hancock community under its care—spending the months of January, February, and March at Hancock. By 1921 the Ministry’s Shop had become a home for Shaker sisters who had been relocated from the Enfield, Connecticut community after its closure in 1917. Museum admission is not required to shop at Shaker Mercantile and dine in Seeds Market Cafe.